" 'Have you ever seen a polypropylene molecule?' a plastics enthusiast once asked me. 'It's one of the most beautiful things you've ever seen. It's like looking at a cathedral that goes on and on for miles.' "
Whether a polymer is natural or synthetic, chances are its backbone is composed of carbon, a strong, stable, glad-handing atom that is ideally suited to forming molecular bonds. Other elements—typically oxygen, nitrogen, and hydrogen—frequently join that carbon spine, and the choice and arrangement of those atoms produces specific varieties of polymers. Bring chlorine into that molecular conga line, and you can get polyvinyl chloride, otherwise known as vinyl; tag on fluorine, and you can wind up with that slick nonstick material Teflon." These are just from the first page of the excerpt. Wow. One loony-tune, and two factually wrong statements. Pretty incredible ratio, huh? I'm done. My first job after graduating was at a polypropylene (PP) film plant (one that I've discussed many times in the past) so even though I haven't made any film in 20 years, I still am curious as to what is happening in the industry. Plastics News has a report on new tenter film equipment being shown at this weeks Chinaplas show. This is obviously a big show for the equipment vendors since the film market in SE Asia is growing hugely. The point of discussion is not the extruders, which are available from an endless number of suppliers, but on the orientation equipment - the roll stacks and the tenters. For background, the PP is first extruded as a wide sheet and cooled. The sheet passes to a stack of heated rolls which (re)heat it from both sides. At a certain point in the stack, there is a gap between the rolls. All the rolls before the gap are turning at one speed, those after the gap are going 5 times faster. This speed difference then draws the film thickness down in one direction (the machine direction). This film then enters the tenter, a large heated oven. In the oven are ever widening tracks which have clamps moving in the machine direction at the same speed as the film. These clamps grab the edge of the film and then stretch in to a width 10 times that of the original width. At the far end of the oven, the film is cooled and the clamps loop back around to the front. The edges of the film are trimmed off removing the polymer that was in and around the clamps, and then everything is wound up. "The newcomer to the BOPP arena goes by the acronym ESOPP, for energy saving orientation production process...ESOPP's most recent developments focus on energy conservation. "The processing of film is energy-intensive and we have developed a patented system to recover and reuse heat from the TDO section back into the MDO section," says (owner Jean-Pierre) Darlet. ESOPP has also developed new clips for stretching PET that can realize a BOPET film with zero shrinkage in both directions. "This is particularly important for BOPET film used in solar applications," says Darlet." The acronyms came pretty in there, so let me translate and explain. BOPP is "biaxially oriented polypropylene" - PP film made with a tenter, as opposed to OPP (same decoding pattern) which is PP film made in a blown bubble. TDO/MDO is transdirection orientation/machine direction orientation, which are the roll stacks and the tenter. BOPET you should be able to figure out. As far as I am aware, PET film is never blown, only made on a tenter. I guess I never thought of the rolls as being an energy intensive operation. I can see that in spades in the tenter oven, and given that the energy for the rolls is comingfrom the oven and going to the rolls, I think I am correct, but regardless, it is an interesting approach to consider when making this investment in a world with ever more expensive energy costs. I also am curious as to why the clips would play a role in making non-shrinking BOPET film. Shrinkage can be reduced by bringing the tracks in the oven in slightly at the very end, but that's the tracks and not the clips. Something to puzzle over, I guess. This is certainly more of an evolutionary step than revolutionary. 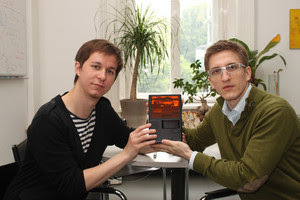 Regardless, the report that researchers at the Vienna University of Technology have created the worlds smallest 3D printer is interesting enough. Given that the price is only about $1700 (1200 Euros), it isn't out of the price range of too many, although the resins feeding it are costlier than commodities resins (which are none too cheap these days either!). The only problem with smaller and smaller printers such as this is that the can only make smaller and smaller parts. That's' great if you are making dentures for an ant, but not if you are making a sculpture for a museum. Where is the news in this? The Dow Chemical Company (NYSE: DOW) announced today that it has successfully demonstrated the use of recycled plastic to generate energy. The successful pilot test measured how plastic that has been reused and recycled to the full extent possible can be used as fuel for an ultimate end-of-life option instead of going to a landfill for disposal." So let me see if I am missing anything: Dow took plastic, burned it and found that they made (released) energy in this process. What a clever idea! Wow, those chemists are so smart! Who would have thought that burning plastics can give off energy? I wonder if people could do this with other materials, such as wood? Is somebody going to patent this? Psst! I don't want to burst Dow's bubble, but most of the trash (plastic and otherwise) generated in the Twin Cities is burned in one of two (1, 2) facilities here that then generate electricity from the heat. Ethan Zuckerman has a brilliant piece called "Desperately Seeking Serendipity". It's a long read, so look when you have time. It's fascinating how he can bring forth ideas from across time and space in a united theme. "We need mechanisms to ensure that search gets complemented with serendipity." Yes! That's what I loved about the old card catalogs that libraries used to have. You never found the book you were looking on the first try. You had to go past books that you weren't looking for but that might still catch your eye and show you something that you weren't looking for. But that seldom happens with search engines. When Google first came out, you would always end up with lots of unexpected results, but that doesn't seem to be the case much anymore [*]. You can't just browse with Google either, just to see what is out there on the web. Zuckerman also talks about forcing physical structures to create serendipity, such as an effort in the Harvard libraries to reorganize the books by size instead of the standard subject classification. Nice idea, but with Google scanning every book in site, that won't do much good, will it? Such physical structures already exist to some degree with the technical journals. Even very specialized titles have a breadth that no one reads an entire journal cover-to-cover. We all pick and choose what interests us, but there still is the chance to run across something unexpected. That's why I still look through Nature and Science whenever I can. As broad as their coverage is, there is something that is outside your scope. Maybe we can hope that Google, with their extensive knowledge of what we already search for, can create a serendipity button, with an algorithm that directs you away from what you normally search. Or at least slips in the occasional mickey. [*] Either their search algorithms have improved greatly, or maybe I've gotten better at using Google. Either way, I seldom get off on fun tangents anymore. And all those dumb commercials for Bing (where they have people ranting irrelevant responses to a simple question) leave me cold. More than just the number of home runs (573, currently #11 on the list) was the distance. 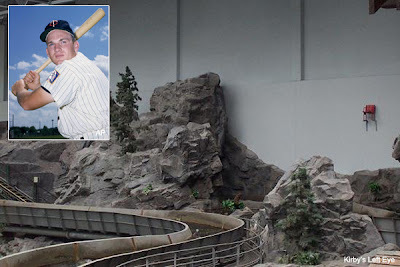 He hit the longest home run ever at the old Metropolitan Stadium, the place where I always saw the Twins play - certainly not the Metrodome. My favorite memory was of the red chair that marked where that ball landed on the upper deck of left field. When the Stadium was destroyed to make way for the Mall of America, three significant steps were taken to remember Harmon. 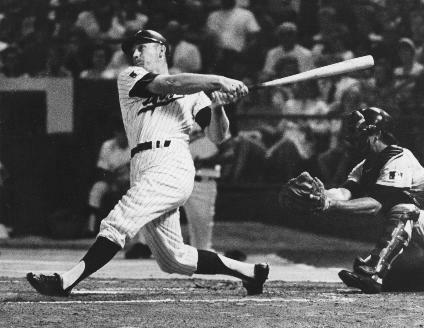 First, one of the roads along side the mall was named Killebrew Drive. 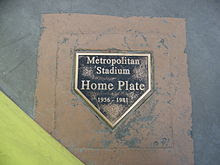 Second, the spot where home plate use to be was marked inside the mall with a metal replica. And third, the red chair was hung on the wall in the same spot it use to occupy in the stadium. Goodbye Harmon; rest in peace. although people are beginning to discover other reactions that fit the name such as the thiol-ene reaction. Given the need for polymerization reactions to occur over-and-over again-and-again repeatedly-and repeatedly, click reactions should have home in polymer chemistry and vice versa [*]. The alkyne-azide reaction indicated above has never been effectively used for polymerizations in part because the large amount of copper left over in the polymer can degrade the performance of the final polymer. The prepared polymers obviously have large amounts of unsaturated bonds that can be great enhancements to the electronic properties, but the residual metals can interfere with this. Fortunately, a group of researchers from China has announced that they have identified a metal-free polymerization scheme (open access). The reaction did require nitrogen blanketing for the polymerization, thus maybe making it less of a click reaction than normal, but that is still not overly oppressive requirement. This was my first exposure to this journal, Science China Chemistry - I don't think it will be my last. In short, I like it. The formatting is high quality, and the research topics seem pretty top-notch too. [*] Thiol-ene reactions are another example that people are beginning to recognize as having "clickability". And they are great for polymerizations – I've presented papers at the last two Society of Plastics Engineers conferences on their use, and there is pretty much an article a month in any of the major polymer journals. Blogger went down last Friday for a while. Chemjobber complained that he lost some posts. I didn't (or at least that's how it appears) but it does appear that I lost the entire Blog Roll, which I only discovered now as I was adding the recently bespoken updates. I think I pieced it all back together, but if something is missing, please let me know. I've got a couple of new additions to the blogroll. First is MundoMaterial, written in both English and Spanish by a polyglot named Lucia. (She also speaks French and Galician). The blog covers materials in general, although her education was in polymers so I expect a bent in that direction. Given my limited knowledge of Spanish ("dos cervezas, por favor! "), I belive the title of the blog would be translated as "World Materials" or "Materials of the World". The other addition is Polymer Composites, written by Vivek Patel of New Dehli. The blog generally has an Indian perspective and focus, but does go beyond that. Slowly but surely the blogosphere for polymers is growing, but I still am envious and jealous of the chemistry blogosphere. A few things we all can do is comment more on the various postings and if you really want to go all out, start you own blog. I'm amazed by how soft the gel is, and yet how it still holds together. It undergoes a very large deformation, very quickly, which suggests that the modulus would increase preventing such strains. We don't have any bearings as to size of the cubes other than when the finger shows up near the end, and then the cube looks to have dimensions of about 1.5 inches (three fingers). Regardless, for the bouncing cubes, the gel distorts to a minimal thickness of about 5% of the original size. Assuming that volume is conserved, then the spread in the other directions would be about the square root of 20 ~ about a 450% increase in the remaining directions! I also find the fine details and vibrations on the surface interesting - the surface is not smooth, although I suspect that that is the result of cutting the cube. I don't have a jello salad in front of me now, but I seem to recall that cut jello is not normally smooth. Regardless, there are still deformations occurring at range of scales, all of which would be a lot of fun to measure and quantify if I had the right instrumentation. My wife and I bought some plastic Adirondack chairs this weekend to replace the old ones that were falling apart. 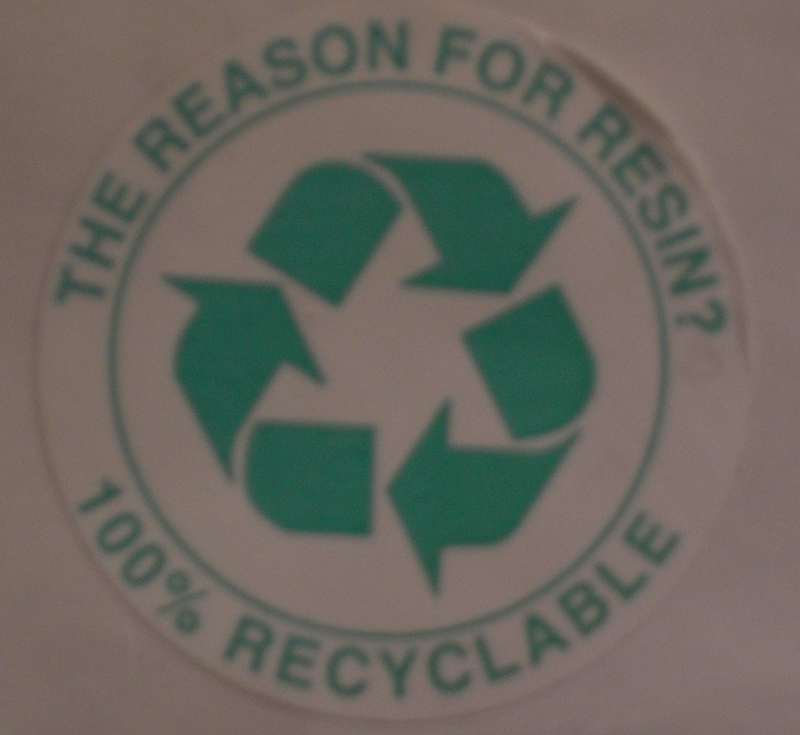 There was a neat little sticker on the chairs: I really like the saying - "The Reason for Resin - 100% Recyclable", so much so that I was deeply disappointed to find that it is trademarked! No one else can use it, which is really a letdown as I can see it catching on across the entire polymer industry. Even licensing it is probably out of the question as it is a trademark, not a patent. The chairs are made of polypropylene (PP), which certainly is recyclable, but I'm not so sure that these chairs would be that easy to recycle. They are big, so they would have to be cut into pieces just to fit into whatever collection bins are being used, but I could only see the PP-5 code in one location, so if the chairs are cut up, most of the pieces would then become unidentified. It is also my understanding that PP is not widely recycled, although given the huge increases in PP pricing as of late (another story for another day), I could certainly seeing that changing, and quickly at that. Some thoughts on Choosing a Major: Chemistry or Chemical Engineering? Chemists suffer greatly from the fracturing of their subject. Chemists, particularly those with an advanced degree, are not just "chemists", they are analytical chemists or organic chemists or ... while chemical engineers are just chemical engineers. Without that limiting adjective in front of their major, ChemE's are not already pre-fitted into a box that may handcuff you for life. It is extremely difficult for an analytical chemist to get out of that field and into say, a product development job . In contrast, I knew a ChemE in grad school who studied surface catalysis the whole time, yet found a job as a polymer engineer. Again, he was a chemical engineer, not a catalytic chemical engineer, and people just see that as being more flexible. ChemE's in grad school don't face that dreaded attitude of "if you don't become a professor, you're a failure" that chemists often do. Most of them enter grad school planning to work in industry anyway. And for those that do decide to stay academic, the need to do a post-doc, let alone multiple post-docs is just not there, probably because the competition for the jobs just isn't there either. For background, I majored in Chemical Engineering, getting my Bachelor's from Minnesota and a Masters and Ph.D. from Illinois. I did attempt to do a double major at Minnesota in Chemistry as well, but couldn't pull it off due to scheduling conflicts - the last class of Inorganic was at the same time as my Control class and both were required to graduate, so a choice had to be made. I will be up front that it will be full of generalizations and stereotypes, so if that bothers you, stop reading now. The fact that generalizations and stereotypes both exist and even have words to describe them says that humans are both prone to using them and that there is some truth to them. I consider them the same way I look at averages - you have a range of data and the average gives you some idea of what it is like. Somehow people are very comfortable with working with averages - too comfortable if you ask me as too many seldom look past them to even see a standard deviation - but somehow never see that a stereotype is just an average. Instead, stereotypes are considered to be as bad a racism, an entirely different concept. Trust me, I know. My wife made that transition. It was not easy. First she had to find a hiring manager willing to take the risk, and then once hired, gain acceptance from colleagues who continued to place her in the analytical chemist box. A thought during my recent flight to Boston: The common understanding is that the Bernoulli Principle is what allows a plane to fly. I beg to differ. 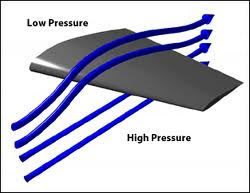 The Bernoulli Principle is what gives the wings lift, but they don't lift the fuselage with its passengers and cargo. To get the main body of the plane up in the air along with the wings, you need van der Waals forces. A plane's wings are held on by adhesives, which in this case, adhere due to van der Waals forces. Why adhesives and not rivets? Adhesives spread out the stresses more uniformly across the entire bonding surface, while rivets would be stress concentrators. I was only there a day, but it was worth the trip. I caught a keynote address by Robert Langer, someone who I was aware of (with over 1100 published papers, everybody should be aware of him) but had never heard. Being a keynote address, he didn't talk about any new discoveries, but instead pulled some highlights from his long career, and a few jokes. If you ever get the chance to hear him, go. My favorite technical paper was from Arnold Lustiger of ExxonMobil on that strange nemesis of plastics, "Environmental Stress Cracking" (something I've blogged about before), and given the active discussion that followed (and wouldn't stop even after the session was over), many other people liked it as well. In a nutshell, Arnold was able to rationalize why certain blends of polymers are able to improve their performance in this testing. The Exhibits included many of the usual suspects, but I really liked the 3D microscope from Hirox (their booth was right across the aisle from our booth, so we had lots of time to drool at the images and try to justify why we needed one) and the GPC-IR instrument by Spectra Analysis. Putting a IR on a GPC is not something I had ever thought of, but if you are looking at copolymers and want to see if the compositions changes with molecular weight, it's an easy way to go. My favorite part of travelling is having hours and hours of uninterrupted time to catch up (even if just a wee-bit) on the stake of technical papers that pile up on my desk. (Today's Dilbert will be blown up, framed and prominently displayed on my desk - forever.) So you have that to look forward to in the coming day's entries. I've been working with silicone adhesives lately - mostly the 1-part acetoxysilicones. [*] Silicones are good examples of an adhesive with lackluster adhesive strength but high cohesive strength so that the overall adhesion is high. Confused? Let me explain. Cohesive strength is the strength of the bulk material, which is pretty high for a silicone adhesive because of the crosslinking. The crosslinking is not enough to make it brittle; there is still a good deal of flexibility which I'll talk more about in a minute. Adhesive strength is how well the adhesive sticks to the substrate. As I mentioned above, it really isn't all that great. I've you ever tried to remove excess silicone adhesive, you'll notice that once you get it started, you can peel it off pretty easily and cleanly. The disclaimer however, is the phrase "once you get it started". 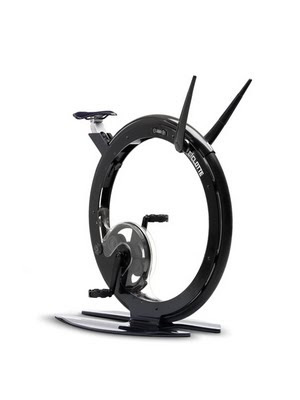 That can get to be quite a challenge because of the flexibility and the cohesive strength. All that flexibility adds to the "toughness" of the adhesive, toughness being the area under the stress-strain curve. By being flexible rather than brittle, the adhesive can deform quite a bit and all the deformation represents additional work that you have to put into the adhesive before you can begin to put work into the adhesive interface. You can see the same situation with foamed and foam-backed adhesives. You can make a pretty measly adhesive look a lot better by coating it onto a soft foam and then sticking it to a substrate. [*] I'm faced with constant complaints about the acetic acid smell. Last year, I had constant complaints about the mercaptains that I was working with (thiol-ene chemistry). My Xmas wish for next year is that Famous Dave's Bar-B-Que wants me to look at the rheology of pork ribs. Then we'll see who's complaining.